The Co-op Connection card saves you money and, costs you nothing. 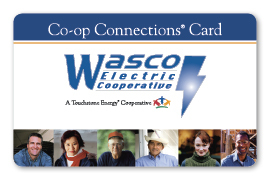 There is no membership fee or annual fee; it is an added benefit of being a Wasco Electric Cooperative member. All you have to do in order to take advantage of this great member benefit is present your card. The Co-op connection card can be used at participating national and local businesses to receive various discounts. Some of the discounts available are hotels, car rentals, pet medication, flowers, and many more. Local business discounts are also available and added periodically. If you would like more information about becoming a participating business, please call Traci Brock at the WEC office at 541-296-2740 or send an email. 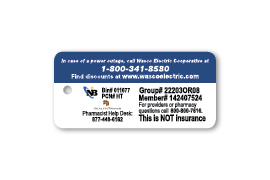 The Co-op connections card is also a member discount card that can be used for prescriptions savings. The pharmacy discounts can save you 10 to 60 percent in prescriptions savings at pharmacies such as Walgreens, Rite-Aid, Fred Meyer, Hometown Drug in Madras and many more. There is also a mail order program available for the maintenance (long-term) medications purchased in 90 day supplies. How much will I save on the pharmacy discount? The discounts save you 10%-60% on prescriptions at more than 56,000 pharmacies nationwide, including our local pharmacies such as Fred Meyer, Bi-Mart, Rite-Aid, Home Town Drugs in Madras, Costco and many more. To see a complete list of local participating pharmacies go to www.locateproviders.com and use the client code of 22203 under groups. Your pharmacy discounts are provided as part of the Co-op Connections program at no cost to you. Yes, if you know the name, strength, and quantity of the medication you can find the discounted price of the medication by visiting www.rxpricequotes.com. No. One card may be used by the entire family. We sent one card and two key fobs to each member at the launch of this program in November 2010. If you have misplaced your card please contact the office at 541-296-2740 and we will gladly mail replacements. This plan is not insurance; it is a pharmacy discount offer. The card provides immediate discounts at the pharmacy. Upon presenting your card to the pharmacist, you will pay the lower of a discounted price of the pharmacy’s regular retail price. There is no paperwork to fill out and no limit to the numbers of times you can use the card. These discounts are available only at participating retail pharmacies. You can go to www.locateproiders.com and use code 22203 as the group number, or call 800-800-7616. You can also search prices by drug and zip code to get the best deals by going to www.rxpricequotes.com. Can I use my Co-op Connection card with my current insurance benefit to reduce the cost? Your card cannot be used in conjunction with insurance. However, use your card to purchase prescriptions not covered by your insurance plan at a discounted rate. Yes. You will receive the best price available to you through this program at the pharmacy. On occasion, pharmacies will price a particular medication lower then the discount rate provided by the card. If that occurs, you will receive the lower price. What is the mail order program? To ensure members always save money on their prescriptions drugs, a unique mail order program was created to complement the network pharmacy benefit. Since most maintenance (long-term) medications are purchased in 90 day supplies, members maximize savings and have the convenience of home delivery (at no additional charge) by ordering through the mail order option.